For the pozole: In a large pot, on high heat, cook pork chunks in 8 cups of water, 2 garlic cloves, cilantro bunch and 1 tablespoon salt. As soon as it starts to boil, remove the frothiness that forms at the top. Reduce heat to low, cover and let cook until the meat is tender, about 90 minutes to 2 hours. Boil tomatillos in 4 cups water on medium-high heat until they are thoroughly cooked. Remove from heat. Grill poblano peppers on a comal or frying pan on high heat. As soon as the skin turns black one side, turn them so they can cook evenly. Remove from heat and place inside plastic or paper bag. Let rest for 10 minutes. Remove the burnt exterior, stems and seeds. Blend tomatillos and the water where they were cooked, along with grilled poblano peppers, serrano peppers and 2 remaining garlic cloves. Pour this green salsa over the meat and add pozole corn; season with more salt, if necessary. Cover the pot and let cook for 45-60 minutes so the flavors can come together. Remove from heat. For the presentation: Top with chopped cabbage, radishes, onion and lemon wedges. To save time in the kitchen, instead of homemade salsa verde use 3 or 4 cups of salsa verde for enchiladas. Use plastic gloves any time you handle fresh chili peppers and be sure to wash your hands with a combination of soap and baking soda after handling these peppers. If you’re a fan of traditional red pozole, then you have to try pozole verde. 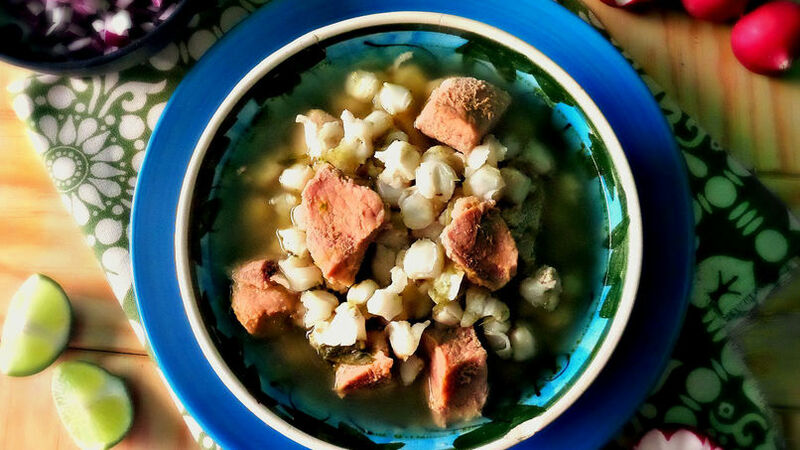 Both versions have chunks of tender pork meat and white corn, but green pozole is made with green chili peppers instead of chile ancho and tomatillo is also added to intensify the green color. A good pozole takes a few hours to cook but it’s so worth the time and effort because its flavor is unique. Celebrate any occasion with this vibrant and tasty pozole verde.